Welcome to the November CTMH Technique Blog Hop! The theme for this hop is "Shake Things Up!" 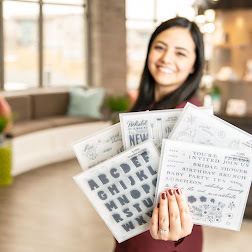 This blog will demonstrate artwork using our shaker die cuts, kits and s along with other CTMH products. I'm excited to see the creative use of ways we can shake things up. If you are coming from Michelle Loncar's blog - you are on the right track. In case you get lost, you can get a complete list of participants at the bottom of Melissa Robinson's blog. 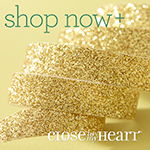 This month we have 21 Close to My Heart Consultants sharing their creations using the "Shake Things Up!" theme. To enjoy this hop is quite simple to do - just click on the link at the bottom of the post on each blog to move to the next one. Here we go! I found an amazing card posted by a CTMH consultant and I immediately knew I would CASE it (Or more like "CASAE" it; Copy And Share Almost Everything)..... However, in my haste, I didn't save the info - not even a photo. So I only have a memory of what I saw and it was great! ; including a video tutorial. If this idea is yours or you know who posted the concept, please let me know so I can give you credit. 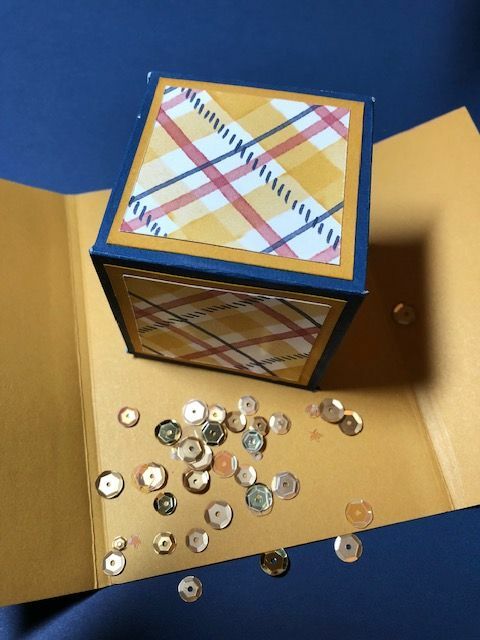 The really neat aspect of the card was that it used our new die cuts so it could be "unzipped" for the card to be opened. I do plan to use that idea when I have more time to play. My first attempt with this "Shake it Up" theme is to use a belly band to hold my "confetti" card together. That way it can be re-closed and reopened. Before I use this card, I will decorate the sides of the box. When the belly band is removed the double gate card opens and the box that's folded flat pops open. - it has a rubber-band inside that is the mechanism to pop it open. I also added some of our sequins as "confetti". I was going to take a video, only the rubber band broke - the only one I could find, it must have been old. So Sad! - I know I have more some where!! Check out the instructions I found. Here's one take on the Poppin' cube and gives the measurements. It also has a shaker window on the box. Here's a second "take" (17 second video) on the poppin' cube in a card. And take 3 has a different mechanism/template. Lots of options and only limited by our creativity. I so very much wish I had a copy of the first Poppin' box in a card that inspired me! 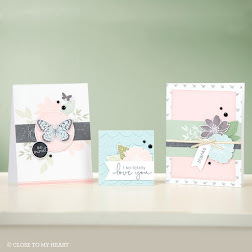 Now hop on over to Catherine Nowak's blog to see what kind of fabulous art she's created. Be sure to drop a comment, we enjoy the encouragement. I hope you enjoy the hop. Great card! Love the shaker on the cover. Love a good surprise card and its doubly special with the shaker card front and the pop up on the inside! OMG this is a fantastic card! Thank you for sharing. 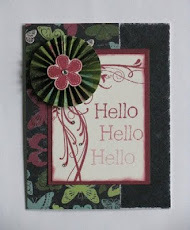 These are super fun cards & I love your take on Laura Beacham card using the zip decorative border. What a fun surprise card! I can't wait to try this, TFS! I've had the same problem with rubber bands. Apparently, every 20 years we need to buy new ones, LOL.